I thought I'd give a little update on two of my previous posts. Despite overwhelming opposition by the professionals that we pay to teach our students mathematics, our district went ahead and adopted the Agile Mind materials. The rollout this fall has been less than smooth, including many technical issues that have been slow to be addressed (students not being able to login, students not being able to load the materials, some of the materials loading but not others, etc.). We are diligently working through those technical issues and I imagine we will solve them reasonably soon. Which brings me to why I'm writing this post. I have a daughter who is in ninth grade and is taking Algebra at Arapahoe, so therefore is using the Agile Mind materials. 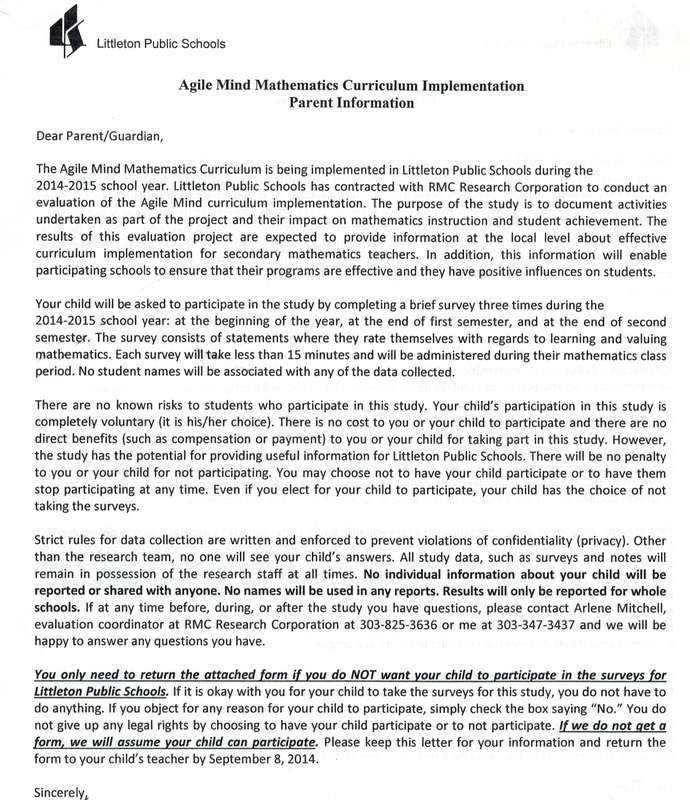 She recently brought home a letter from the district saying that all the students would be surveyed three times throughout the course of the year to help determine the impact on mathematics instruction and achievement of the use of the Agile Mind materials. The purpose of the letter was to allow us to opt-out of the survey if we wished, per School Board policy. Normally we wouldn't have any issue with our daughter taking a survey such as this but, for the first time, we are choosing to opt her out. It's not just because of the 45 minutes of mathematics learning she will miss out on while they are taking this survey, although that's certainly part of it. But it's because of the letter itself, and how it reflects on the above discussion and my previous blog posts. Here's the full text of the letter. Do you notice anything about this letter? Here's what I noticed. It refers to the Agile Mind Curriculum in the header and three separate times in the the first paragraph. It's not a curriculum, it's materials that have been adopted to support the curriculum. This may indeed just be a slip of the keyboard (although four times in one paragraph is a whole lot of slippin'), but the problem is that - whether it's a slip or not - that is exactly how it's being implemented by the district. It's being treated as a curriculum, not in support of the curriculum. Not only is this exactly what the professional teachers of mathematics feared back in the spring when we were discussing this, it is in direct violation of the curriculum adoption process in our school district. I've stated before that I think the materials adoption process in our district is deeply flawed, but at least it was a process that was more-or-less followed, even though the results of that process were not ideal. But clearly the process for curriculum adoption was not followed, and so for the district to now be referring to this as the Agile Mind Curriculum in a formal communication home to parents is stunning. As a parent of a ninth grader enrolled in Algebra at Arapahoe High School in Littleton Public Schools, I'd like to know what the LPS School Board is going to do about this? The problem, Karl, is that the textbook is the curriculum. The textbook is not the standards. It is, the curriculum. Your question makes it too easy for the board to say, nothing! You need to ask a question that requires them to defend and indefensible position. For example, how do you justify giving up three days of math instruction for the purpose of evaluating a product that collects enormous amount of data on its usage? Or, given this list of problems with the curriculum that we purchased, what steps have been taken to recoup somesome money from the company, and what policies will be implemented to ensure that we do not get ripped off again? Thanks Jethro. Well, yeah, your questions are good, too :-). Hello Karl, my name is Kela Miller and I am a student at South Alabama. I am currently enrolled in EDM310 and I have been working on my blog, http://millerkelaedm310.blogspot.com/ . I must say that as a father and educator you are a prime example of someone who cares. I can tell that you want the best for your daughter and for the schools by reading this post. Hi Karl. I've You mention that the materials adoption process is flawed. Is this because teachers haven't been provided with the appropriate professional development to implement this new curriculum? Were teachers not prepared for this change? Or is that the materials don't actually provide the teachers with the right type of teaching tools, flawed technology, etc? Liking or not liking this particular approach is certainly an issue, everyone has their personal preferences but ensuring that teachers are prepared for the actual "change" and implementation is key. Umm, no. The problem is that it was a materials adoption, not a curriculum adoption, yet now they are treating it as a curriculum. Hi Karl. Thanks for your response. I obviously don't know all the details and am not directly involved. But it sounds like they were not clear in their intent or perhaps their intent changed over time but this wasn't properly communicated to all the stakeholders. That's why I'm a big proponent of proper change management and communications when running any project or implementation.